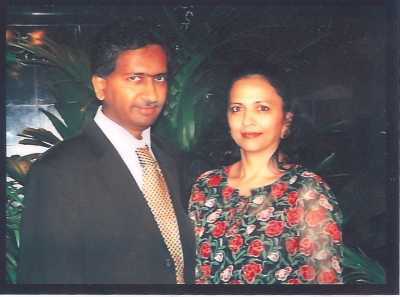 Ramesh Mahalingam is President of Pratham USA. He co-founded the Pratham NC Chapter. Pratham is the largest non-profit organization working in the area of primary education in India. It is involved in helping sixty million children in over five hundred districts of India. It was seeded by UNICEF in 1994 and serves 21 states in India. Ramesh was born and grew up in Chennai. He spent several years working in Mumbai and has also lived in Singapore and Australia. He came to Raleigh in 2000 to work for Aventis CropScience as CFO of the North American business. He currently works for Sodexo as Vice President, Corporate Controller and Chief Accounting Officer. Kubi: What inspired you to join Pratham? Mr. Ramesh: In 2002, I was flying to India and happened to be seated beside Ramesh Parikh, the Treasurer of Pratham USA. I learnt about Pratham during the long flight. I was impressed with the work that Pratham was doing and also about the dedication of Ramesh Parkeh to the cause. On my return, I quickly got busy with my work and my company was getting bought by Bayer. My wife Chithra kept me reminding that we should get involved in charitable causes and we cannot keep waiting. In 2004 we started getting involved with Pratham. Being new to the area, we had limited contacts and had to reach beyond our circle of friends. We even ran a classified advertisement in an Indian magazine to invite like minded people to join us. We had the first meeting of the Pratham NC chapter at our home in Jan 2005, What was unique about the chapter was that seven families which did not know each other came together for this common cause. During the first year, Pratham NC raised $25 K. We continued to grow and raised 200K in 2008. After I stepped down from the Chapter leadership, Dr. Om Dhingra took over as the chair for Pratham NC in 2008 with Arun Shukla as Co-Chair. For 2009, Gunvant Bhakta has taken over from Arun as Co-Chair. What is unique about Pratham NC is that we involve the entire family into volunteering for the charity. In Nov 2006, Chithra and I were at the Pratham USA national conference in Houston. There was a common feeling amongst all the chapter heads that Pratham USA should be growing faster. and should be organized more professionally. I took the lead along with some other chapter heads. and came out with a new plan for Pratham USA that we called “Quantum Leap”. Later, I was requested by the National Board to take the responsibility for running Pratham USA. It was a very difficult choice for me. While I believe in the cause and in Pratham, I had a full time day job. I accepted the call and took over as President of Pratham USA in Jan 2007. I spend most of my leisure time now volunteering for Pratham. When we want to grow the charity, we need to get the right people on board and remove bottlenecks and also communicate better with Pratham India. We also need to make sure that the cause is kept at the centre of every thing we do and keep politics is kept out. I am pleased to tell you that we have grown from a $3 million charity in 2006 to a $10 million charity in 2008. This was possible due to large grants from Hewlett, Gates and Google Foundations as well the growth in individual fund raising across the country. People say all the time that Indians are not generous in giving. I have had a very different experience. People are generous if they find that the charity is run well and the money they donate is having the desired outcome. Kubi: Please tell us about Pratham? Mr. Ramesh: In 1994, Pratham started with sponsorship of UNICEF to address the needs children in slums who are not attending school. Nearly 25% of children in India were not attending school during the nineties. Madhav Chavan and Farida Lambay founded the Pratham to help children in the slums of Mumbai. They recruited 10th grade girls from slums as teaches and asked them to get the kids from their slums who were not going to school. The teachers were provided with teaching material and training. This worked very well. Pratham took these programs to other cities in India... Chithra has travelled extensively to Pratham programs. She can tell you more about how things work. Mrs. Chithra: The concept was not to build infrastructure. Instead, the concept was to use a low cost model to educate more children and also a program which could be self sustaining in the long run. Instead of sending in outsiders to the slums to teach the children , Pratham found a volunteer within the slum to teach. This gave the volunteers ownership because they belong to the area and they knew the parents of the children and could connect with them. Pratham also believes in partnering with Government. Corporates and the community to deliver the results. The low cost model and triangular partnership worked very well prompting them to expand into cities outside Mumbai. and has already impacted 2 million children across India. In essence, Pratham’s mission is “Every child in school and learning well”. The focus is primary education and improving quality of primary education for the underprivileged children all over the country. Kubi: How many kids have been helped and what are your future plans. Mr. Ramesh: 2 Million children have been helped in the slums. The number children not going to school has come down in 2008 to fewer than 4%. In 2005, Pratham conducted a national survey (called Annual Status of Education Survey) and found that 60 million children in India were not learning at the required level. For example, 25% of children in Grades 1 & 2 cannot read letters, words or more, 34% of children in Grades 3 to 5 could not even read Grade 1 text or more. About 45 % of the children could not perform subtraction or more. There is a national crisis in India. Children are going to school but about half them are not learning at the required level. There are several factors which contribute to this problem. Teaching material and methods in India have not changed for the last several decades. Many parents are illiterate and cannot even find out for themselves if the children are learning at School, leave alone teaching them at home. Pratham had been experimenting since 2002 with accelerated learning and teaching techniques to help children learn reading, writing and basic math. In several small and large scale pilots across the country, these techniques demonstrated that children could be taught to read, write and do basic math in just 3 months. With children all across India being left behind in school, Pratham launched a campaign called 'Read India'. This marked a major shift in focus from out-of-school children to children who were in the school but not learning properly. The 'Read India' campaign has so far touched the lives of 20 Million children in 350 districts. Our plan is to help 60 Million kids by 2010. Kubi: What are your plans after Read India program ends in 2010? Mr. Ramesh: Read India focuses on basic reading, writing and basic Math. Primary education is a much larger challenge than what Read India will tackle. Once we achieve basic learning levels, we will help kids to go to an even higher level of learning.Pratham will focus on about 200 districts which need a higher level of intervention and continue to improve the literacy levels of children. Mrs. Chithra: 2010 was the goal set by Government of India for universalizing primary education which again is one of the millenium development goals set be UN .Pratham has taken it upon itself to help the Government of India to achieve this goal. Kubi: What are the challenges Pratham is facing here and in India. Mr. Ramesh: The biggest challenge is getting the right type volunteers either in India or in US. In addition, Pratham India has the challenge of attracting talented people to work for Pratham. People need to have passion for the cause if they have to work for Pratham. In some states Pratham does not get full co-operation from the State Governments. The only way to collaborate with Government is to prove that Pratham’s methods really work. Another element of public private partnership is to make sure that you share in the task and also in the success. I am happy to tell you that Pratham now has collaborations with 15 State Governments. Kubi: How can an Individual contribute to Pratham? 2. Spread the word. Visit Pratham sites in India, learn about it. We have a responsibility to our home country. We all are beneficiaries of the Indian education sustem.We cannot turn our back to the fate of the 60 million underprivileged and illiterate children in India. The responsibility for our home country need not be at the cost of our social obligation to our host country. All Indians in the US should invest time in understanding the problem of illiteracy in India and should become part of the the solution to the problems. Some of the Indians who might be considering going back to India and working for the progress of India can take inspiration from Dr. . Madav Chavan, founder and CEO Pratham. Madhav completed his PhD in US and has gone back to tackle the problems of India. Some other Pratham leaders like Dr. Rukmini Banerji and Dr. Balaji Sampat have done the same. We can join them, whether we go back to India or continue to live in the US. Kubi: How can an employee influence his or her company to donate to Pratham? Mr. Ramesh: The companies can help in many ways. They usually have matching programs where employee contributions are matched by the company. Request your company to include Prathm in the list of charities. Introduce Pratham to your organization and Pratham can come in and explain the programs in India to your company. Also, influence your company to sponsor local events; the companies will get exposure and publicity as well. Kubi: What are the differences in fund raising between Indian and US? Mr. Ramesh: Majority of the funds for Pratham come from the US. This includes both individuals and corporations. Fund raising in India needs to improve.. Pratham is taking steps to get more help in India.. ICICI and several other Indian corporates are helping Pratham. I hope that more Indians who live in India will take to philanthropy. Wealth creation without a habit of giving leads to social inequality. Kubi: What challenges are you facing in India to raise fund rising? Ramesh: I feel that we have not reached out to people in India. . Fund raising needs a strategic plan. It requires a lot of dedication, professionalism and persuasion to get people to donate... That is what we are doing in US. In India we have the added challenge of changing the mindset, since charity is not part of the Indian social fabric. Common people consider that charity is only for ultra rich people. They feel that Government has to take care of all the social problems We need to educate, explain and engage people and then persuade them to donate time and money. The younger generation is more open and ready to donate. I am optimistic that fund raising will improve in India. Kubi: How Pratham is different from other educational organization like Ekal? Ramesh: Ekal runs schools in remote villages and tribal areas in India .. Pratham works in cities and villages. Pratham is present across most of India, works on advocacy, education innovation for primary school kids, Annual Status of Education Surveys etc. Kubi: Please tell us about the contributions from Foundations and corporation? Mr. Ramesh: We have several foundations that support Pratham. Google gave us a grant. Hewlett & Gates foundations have given us a $9 M (spread over 3 years) grant. There are many other foundations that are contributing to Pratham - IBM, GE, Johnson & Johnson, Dell computers, Citi Bank, United way, Duestche Bank, Credit Suisse etc. .
Kubi: Chithra how are you helping Pratham and supporting Ramesh? Mrs. Chithra: Ramesh and I are passionate about education and we always felt the urge to give back in whatever we can.I try to spread the awareness about Pratham and also help in organizing fund raising events in NC and also in other Pratham chapters in US .The support from people around me has encouraged me to take more commitments and work harder for the cause. I have enjoyed meeting a lot of passionate and like minded people.. Ramesh and I have complementary skills and help each other. I am actively involved in the NC Chapter. My goal is to take Pratham to new people and more families both in NC and other cities. Both of us believe in the cause and will continue to support the cause. Right now I am working with a group of people who approached me and said they would like to do something for Pratham. We have worked together to develop the idea. We will be presenting a 2 hour Musical on May 17th at Green Hope High School, Cary. It will be something like a Broadway show. The team is working very hard and we have a great talent here. This event will also help bring the community together and show case the local talent, apart from raising funds for Pratham. Mrs. Chithra: Triangle is a great place to live in. People were skeptical if we can raise much money from the Indian community here. But we have shattered this myth by rasing $250,000. We are very thankful to the Pratham supporters. Pratham NC team is doing a great job and we enjoy working together. We want to do more events which can bring the community together and spread of the awareness of Pratham. Read about other Inspirational Triangle Indians here.